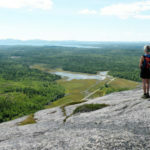 Aislinn Sarnacki of the Bangor Daily News recently featured FBC’s Simon Trail in her 1-minute Hike Series. . . .
Hancock – Frenchman Bay Conservancy (FBC) has received a $100,000 grant from the U.S. Fish and Wildlife Service’s North American Wetlands Conservation Act (NAWCA) grant to permanently protect 167 acres along Taunton Bay. These acres are within the Taunton Bay Beginning with Habitat Focus Area, one of the most significant tidal wading bird and waterfowl . . . 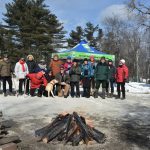 While there was not enough snow for skiing or snowshoeing, FBC held hikes at the Sunrise Trail and Simon Trail to celebrate Great Maine Outdoor Weekend. Nearly 30 people joined us on Saturday, February 4 to hike a portion of the Down East Sunrise Trail and enjoy a bonfire and refreshments. This event was co-sponsored . . . Thank you to all who took the time to take our Strategic Planning Survey! We will use your feedback to help us develop our new long-range plan. Stay tuned for more information! . 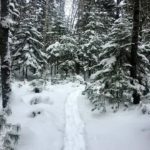 . .
More trails to come in Gouldsboro! 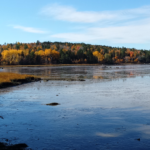 HANCOCK — The Frenchman Bay Conservancy’s decade-long goal to create a 10-mile “wildlife corridor” from Schoodic Mountain in Sullivan to the Schoodic Peninsula has received another boost. The organization recently received a $5,000 grant to conduct a natural resource inventory and develop a management plan for newly acquired property on the Schoodic Peninsula, according to . . .
FBC’s new Schoodic Connector Trail was featured in the Portland Press Herald on November 6, 2016. Hiking in Maine: Schoodic Connector Trail destined to be a classic . . .